In many ways it made perfect sense that he was screaming, “I hate you! I hate this!” at the top of his lungs. After all, it was I that was holding him down while he was being inflicted with pain. This was not the first time but one of recent many. The “I hate yous’” were becoming more frequent and also more painful to hear. There was one particular time however that is forever etched into my memory. Noah was 5 years old and I was sitting on the edge of his Pediatric Intensive Care Unit (PICU) bed, holding him tight in my arms so he couldn’t move, while the nursing staff changed his PICC line dressing. This was something that had to be done on a regular basis. Due to Noah’s genetic syndrome, he has more hair than a typical child. Tape and tegaderm are one of the things he absolutely hates the most because it really hurts coming off. He was crying, screaming, and looking me straight in the eyes. I knew he didn’t understand why I had to be a part of this painful process, preventing him from fighting back and allowing them to do what they were doing. He didn’t understand that he had to go through this so he could be healed. The nurses were silent as he cried and quickly did what they had to do. In my calmest voice possible, I just said over and over, “I’m so sorry; I love you so much.” What nobody saw or heard that day was at the same time my son was screaming, my heart and mind were screaming just as loud, and I physically felt sick from it. In his whimper, he then said to me, “I love you too mommy.” I knew he never truly hated me. It was just his plea to be allowed to fight back when the pain started, an attempt to defend himself. The truth is, I was a complete mess inside and was barely hanging on. Noah had been in the hospital for a few months by this time after a life threatening illness. I was probably at one of my lowest points emotionally, physically, mentally, and spiritually. I knew that others were experiencing more difficult things in life, even within my own extended family. Because of this, I was finding it very difficult to communicate my feelings or this depth of isolation with anyone, and it became a private struggle between God and me. 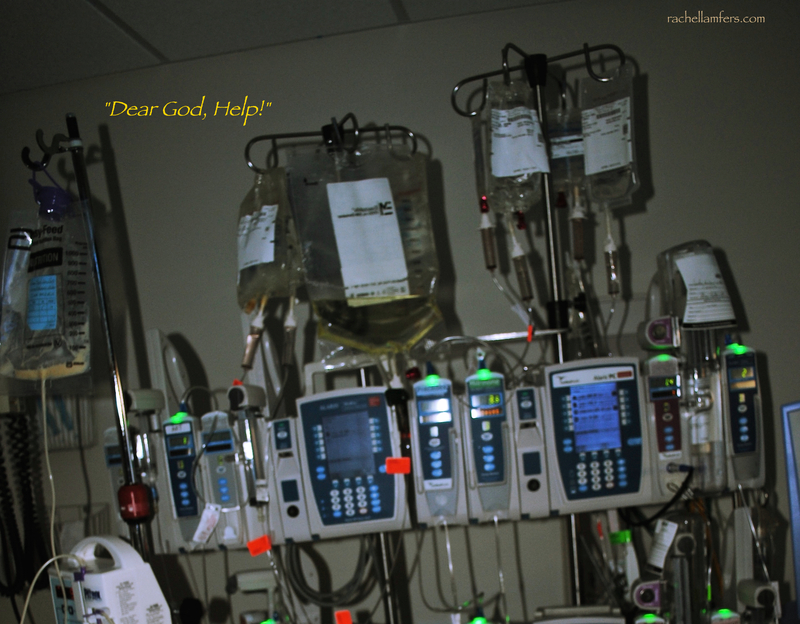 One night as I lay down on the pullout bed in the PICU, I knew that I had to hang onto my faith. I knew that I needed to pray, even though I was finding it very difficult to even do that anymore. Sometimes, I would allow several days to go by without taking the time to speak to God. Partly from pure exhaustion on so many levels, but also from a frustration that had made its home deep within. Speaking to God in the midst of some of the roughest days was something that I choose to leave to others to do for us. That particular night however, as I lay quietly, the stillness in the room was filled with the alarms of the machines going off. The only words I could muster were, “Dear God, Help.” Those 3 words became a frequent prayer of mine after that, but I understood that was all that was needed to be spoken. In the days that followed, there were many more procedures and crying, and my heartstrings would be tugged and pulled on very hard. However, a new grace-filled realization started to cover me that would eventually bring me peace. I needed to hear and feel those words at that moment. But even more than that, I needed to believe it. You know, life doesn’t make perfect sense. At least it doesn’t to us. But you are His child and you are being held tight in His hands. Hands that love and can heal for His glory. You write so beautifully and much of your writings capture the same emotions I hold within my heart. So grateful to know you, truly an inspiration to so many, thank you! I appreciate your support Karen! I know you have first hand understanding of what life is like with a special needs child. So many times when you write on your CB site, I feel that I am reading the same things I wrote in the past when we were in that stage! One day at a time! Thank you Angie! God bless you as well! Thank you Ruth for your kind words! I really appreciate it. Thank you for sharing your heart, Rachel. You are touching many lives through your blog. You are a beautiful writer and a beautiful person! Thank you Gloria for your ongoing encouragement as well! Until you have been there you can’t understand – but it is true!! Let the Lord live it out through you – “He wept,” He knows, He cares. Rest in His arms in the midst of it.